Real Options Valuation provides a set and analytical tools for valuing strategic business management decisions that have a range of possible outcomes. Potential volatility of project or business cash flows can be utilized as a proxy for underlying risk for which a valuation can be derived based on the probability of each outcome eventuating. 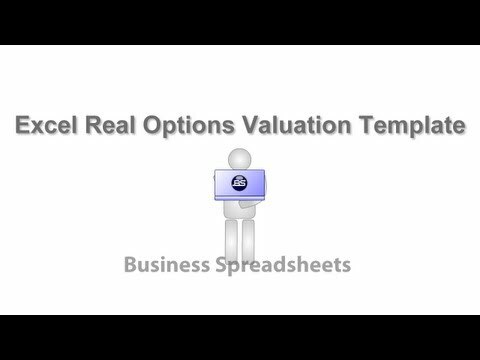 The Real Options Valuation model provides a simple guide in order to select and employ the most relevant valuation solution to the proposed strategy being considered. A modified Black Scholes option pricing model is provided to quantify the value in abandoning, delaying or expanding business projects. The Nash equilibrium game theory model is provided to evaluate the benefit of being a leader or follower when entering a competitive market. The binomial option valuation model allows the creation of multiple binary branches with corresponding outcome probabilities to flow back to the valuation at the origin node. The Real Options Valuation runs on both Windows and Macintosh operating systems. There are currently no reviews of Real Options. Detailed help and explanatory tips through work flow. A collection of real options valuation tools with assistance on choosing the most appropriate model covers all aspects of real options pricing and valuation. Below are some frequently asked questions for Real Options. Q. What type of pricing plans does Real Options offer? Q. Who are the typical users of Real Options? Q. What languages does Real Options support? Q. Does Real Options support mobile devices? Q. Does Real Options offer an API? No, Real Options does not have an API available. Q. What other apps does Real Options integrate with? Q. What level of support does Real Options offer?